These books are all available as paperbacks, as well as eBooks, so you can buy them and stock your bookshelves with them! I've provided a description of each one with links so you can be whisked away to purchase them. Thank you for your patronage! If you're looking for my free short stories, and there are a ton of them, check out my Free stories page for audio versions. You can also read all of my short stories for free at Wattpad, which has even more than you'll find available at eBook retailers! Happy reading and thanks for stopping by. Barnabas and his friend Jeff made a great snowman but it has gone missing! From the huge round footprints in the snow it looks like it came to life and walked off. Then they see on the news that the local bank, where Barnabas's dad works, was robbed! A strange crime scene is left behind with large puddles inside and half-melted snowmen outside. 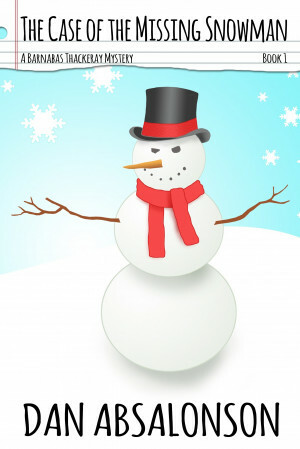 No one believes Mr. Thackeray's claims that snowmen robbed the bank so he loses his job. Barnabas must solve the crime to get his dad's job back. This grade school chapter book is full of laughs, adventure, mystery, and magic. It's great for intermediate readers ages 7 and up but adults will love it too! A great story to read to kids or to give to children who have started reading longer books. Ray is a friendless realtor who stumbles on some supernatural tools, including a sword, that can rid a property of evil spirits. He decides to use them to change his career and finally become a house flipper, but on a grander scale. He plans to flip old haunted mansions that no one else will buy, rid them of their evil spirits, renovate them, and sell them for a hefty profit. Getting them to leave isn't as easy as he'd hoped and he has some competition from Bill Baldock, who buys up haunted mansions to destroy them and build apartment complexes in their place. Discover a new world within our own with Ray as he tries to learn how to use his new tools against demons, make new friends, and outsmart new enemies. Drade is just a villager manning a merchant table with his father Aren until two mysterious swordsman come to town. They claim they are there to take Drade and every other young man with them in their caged wagon. After a brutal sword fight helped with a magic potion Drade journeys north to the farm of his grandparents to fulfill a promise. Along the way he meets some colorful characters. He helps some of them. Others help him on his quest to reach his grandparent's farm before the villains he fought get there first. There is no way he will be able to face them again without a lot of help. Will has problems. A few years ago his pregnant mother died. His Dad has reduced himself to a drunk. Dad gets violent when he drinks, which is all the time. Will decides to run away, but ends up destroying another family by taking all of his anger towards his dad out on a stranger. Can this all be reconciled?